North Point is a new gated community located just around the corner from Medical City off Boggy Creek Road. Located just inside Osceola county, North Point features homes built by Lennar and Mattamy Homes on 60' and 80' homesites. Residents of North Point enjoy a clubhouse, pool, gazebo and tot lot playground. Just outside of the gates is Austin Tindall Park which boasts sports fields for lacrosse, football, rugby and soccer. 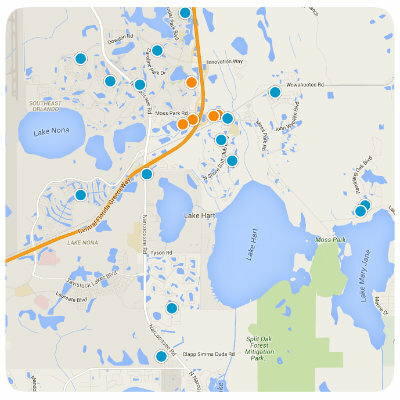 North Point makes a great choice for buyers who want to live near Lake Nona and Medical City but enjoy lower home prices and taxes. Where is North Point in Kissimmee? North Point is located just off Boggy Creek road and is tucked away between East Lake Toho and Fells Cove in Osceola county. To reach Medical City, you would simply turn east on Boggy Creek and Left on Narcoossee. View a Google Map of North Point. The two home builders now in North Pointe are Lennar Homes and Mattamy Homes. Both offer homes with unique floor plans, classic Florida exterior elevations and a variety of home sizes. Many of the homes sites offer water or conservation views. North Point Ph 1c SubDv. North Point Ph 2b-2c SubDv. North Point Ph 2a SubDv. North Point Ph 1b SubDv.